Maya Erskine and Anna Konkle star as middle-school besties Maya and Anna in the unconventional Hulu series PEN15. They should have called it something else. It's not that the name PEN15, with its allusions to juvenile if not infantile scribble humor, doesn't capture something cheerfully dumb about the setting of this new Hulu series about middle school. But the title suggests a cheap and bawdy laugh — which certainly has a place in the world — when in fact, by the end of ten episodes, the show has offered a portrait of adolescence in girls that is very funny, but also might be as tender as anything since My So-Called Life. The show was created by comedians Maya Erskine and Anna Konkle, both of whom have been popping up on other people's TV comedies for years, and Sam Zvibleman, who directed and produced some of the run of the very good series Take My Wife. The conceit is a little convoluted, and in the telling it borders on gimmicky, but: Erskine and Konkle play 13-year-old girls, best friends also named Maya and Anna. All the kids around them, their friends and frenemies, are played by actual kids. This could have been completely distracting, particularly with the tall Konkle towering over the real young teenage boys she's playing opposite. But both actresses read quite young, and both have such a firm handle on the versions of themselves they're playing that the gimmick recedes within an installment or two, and it leaves behind the story. 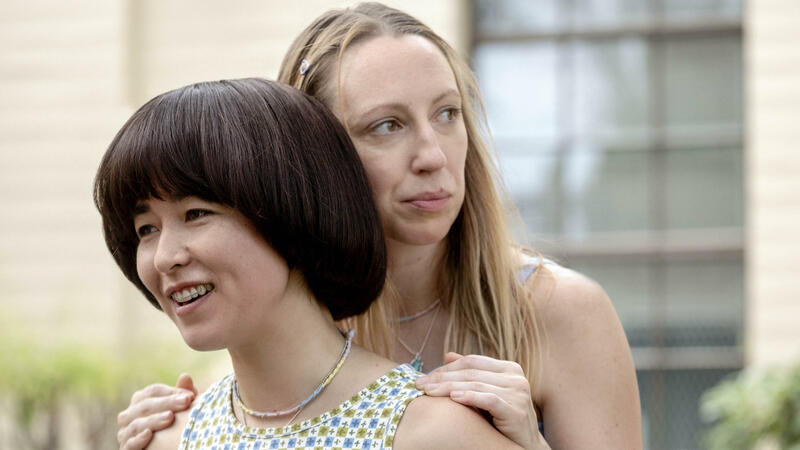 PEN15 is well balanced between episodic plots — a dance, a service project, a music recital — and longer threads that stretch across the season. Maya and Anna are inseparable, determined to experience all of their rites of passage together, from first kisses to first cigarettes. Both are girls who mostly manage invisibility: They aren't popular, and in fact, they're unnoticed by most people besides each other. They are not tormented, much, unless they stick their necks out. Of the two, Maya is a bit more outspoken; Anna is a bit more socially pliable. But only a bit. As the series progresses, it moves past the basic middle-school plots about fitting in and fighting with parents and being made fun of, and it begins to give the girls more universal emotional stories about family and loyalty and loneliness, and how we forgive the people we love. Like the prized My So-Called Life episode "Other People's Mothers," the episode "Anna Ishii-Peters" explores the complicated relationship that best friends can have with the parents that are theirs and the parents that aren't — the other parents in the other houses, who comfort and nurture and don't have years of fighting and frustration to fog the picture. The girls both make terrible mistakes, both in their handling of their friendship and otherwise. And while some of those mistakes do end in cringing and in vicarious embarrassment so unsettling that it feels like a bug crawling up your back, some of them end with simple hurt feelings. And when they do, PEN15 does the one thing a good show about adolescence must do: It recognizes that the substance of these conflicts may seem ridiculous with the benefit of hindsight, but the feelings that are involved are entirely genuine. An obstacle you might be able to peek around fairly quickly in adulthood can blot out the sun when you're 13, and respecting those feelings is the difference between plausibility and authenticity in a show like this. It's plausible that a kid will sob her eyes out because someone left a note on her locker; the story only feels authentic when the show treats that pain as important and deserving of attention. It'll sneak up on you, this gem. At the beginning, it seems affected and a little self-conscious. But as the girls settle into their lives — as you see Erskine offer the best portrayal I've ever seen of a girl who snaps back and forth between longing to be a teenager and literally having kicking-and-screaming tantrums in which she declares that her loving father is ruining her life — you'll hear the heartbeat of the friendship between these characters. And it never feels false for a minute, even as two actresses reach back decades to tell the truth about how it felt to be younger, more trusting, just a giant exposed nerve eager to be tweaked by the next experience, good or bad.